Colour conscious: Eggs are fried in turmeric as Kashmiris don’t like white food. The decline of Mughlai food (the real McCoy that is, not the upstart version you get in restaurants) started because of the richness of its ingredients and the intricacy of the preparations. Bengali widows’ food is on its way out because society is becoming less and less traditional. 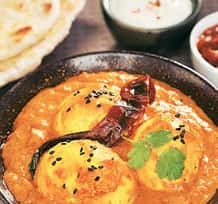 Many of India’s micro-cuisines are in danger of extinction because they are too tedious; plus all the old cooks have died and everyone’s eating lighter anyway. But a section of Kashmir’s cuisine is going the way of the dodo because a road has now become all-weather. It sounds as if dried vegetables were a diet of deprivation, but Kashmiris have a way with food: give them a sheep and they’ll give you a 20-course wazwan. So, cooked dried vegetables (hokh syun in Kashmiri) morphed into a feast. Italian sun-dried tomatoes are sold in the rest of the world at a hefty premium precisely because drying out the water content of the vegetable increases the intensity of the flavour and does interesting things to the texture. In the seventeen-and-a-half years that I have been married (my husband is from the valley and my in-laws live there round the year), winters have become less severe—to the extent that quite often there’s no snow at all in Srinagar. That, in turn, means that National Highway 1A, that leads from Srinagar to Jammu— the route for all supplies to reach the valley—is easier to maintain. When the road is blocked for four days every five years due to snowfall, it hardly calls for the level of self-sufficiency that was the norm until 30 years ago. About five years ago, shops in the city started selling dried vegetables, and the writing was on the wall. Today, even in our family of dried vegetable junkies, hardly a kilogramme or two of turnips is dried. And in autumn, my mother-in-law no longer excitedly comments on the aubergines drying in the vicinity, because nobody really bothers. Fry the boiled eggs with a pinch of turmeric in a deep frying pan till the whites become golden brown partly because of the frying and partly because of the turmeric. Next, pick either chana or whole green moong dal: This is a cuisine for lean times, so ingredients are somewhat variable. If using whole moong dal, soak for a few hours. Pressure cook till done: one whistle on high fire and then 7 or 15 minutes on low flame (depending on the dal), so that the texture of the lentil remains, but barely so. Temper the onion, turmeric, black cardamom and saunf in mustard oil (for complete authenticity). First add the tempering to the dal and cook, stirring vigorously, then add the eggs and finish on a low flame for a few minutes. Serve with rice.